I find each step of quiltmaking, from beginning to end, a real challenge, and it is hard to say what part I like best. 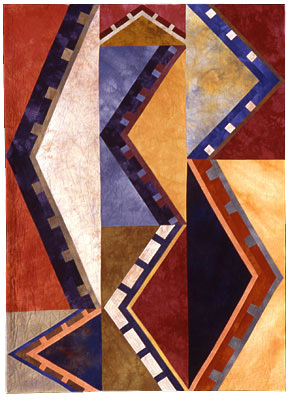 I love the pure creativity involved in conceiving and designing a new quilt. I love to piece and most of my quilts are made that way. I don't know why, but I purely adore stitching those ¼ inch seams. Although I used to hand quilt, most of my work is machine quilted now, although I often add seed stitching which is done by hand. I started working in series in 1989. The quilt pictured here is from my Roadsigns series. I enjoy working in a series as it allows me to expand a design idea. Janet's accomplishments are too numerous to mention here. Aside from a number of solo shows, she has been juried into virtually every prestigious art quilt show you can name, including Quilt Visions and Quilt National a number of times. Indeed, she was just juried into Quilt National 2017. She has won numerous prizes at the International Quilt Show in Houston and was awarded Best of Show in the 2004 exhibit for the Association of Pacific Northwest Quilters. Her work was also seen in the international European invitational Color Improvisations curated by Nancy Crow.